Express your transitional tastes with this elegant sofa/media table. 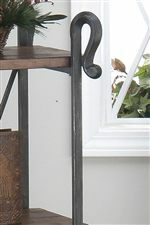 The piece offers graceful shaping on the tubular steel base, with shepherd's crook shapes extending from the top and "X" stretchers on the sides. 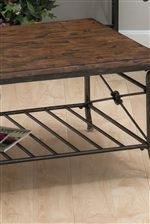 The base is topped by distressed rustic pine, which exudes warmth and rich traditional style. One wood shelf and one slat shelf provide excellent storage space, whether used as a media stand or an accent piece behind your sofa. Elegant and versatile, with perfect storage and a beautiful blend of materials, this sofa/media table is sure to complete your living room decor. The Rutledge Pine collection transforms any home with its harmonious blend of rustic woods and shaped tubular steel, bringing you the elegant look of traditional style with the easy appeal of relaxed decor. Comprised of a cocktail table, end table, sofa/media table, and an etagere, this beautiful collection of occasional tables has everything you need to complete your living room in a style that recalls transitional tastes. 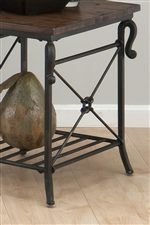 Simple distressed solid pine table tops in a warm Rutledge Pine finish balance detailed steel bases, which feature "X" shapes across sides or backs, and charming shaping reminiscent of Shepherd's crooks. Equipped with either metal slat shelves or pine shelves, the tables offers plenty of space for displaying trinkets or storing items like books, inviting you to make each piece your own. Elegant and refined, with a relaxed, airy quality, the Rutledge Pine collection suggests a new standard for sophisticated everyday decor. The Rutledge Pine collection is a great option if you are looking for Traditional furniture in the area.